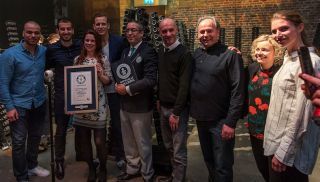 JBL breaks Guinness World Record | What Hi-Fi? After successfully playing 1,000 Flip 4 Bluetooth speakers simultaneously, the company beat the previous record of 208 speakers set by Ultimate Ears in 2016. In order to make sure that everything was above board, whathifi.com editor Simon Lucas acted as adjudicator alongside Jack Brockman from Guinness World Records. The Flip 4 Bluetooth speakers, which follow on from the Flip 3, were connected using JBL's Connect+ technology and displayed in a semi-circular ring of 50 stands - each holding 20 speakers - to create a 360-degree wall of sound. Other features of the Flip 4 include a built-in 3000mAh battery, IPX7 waterproofing, voice assistant integration and a speakerphone.